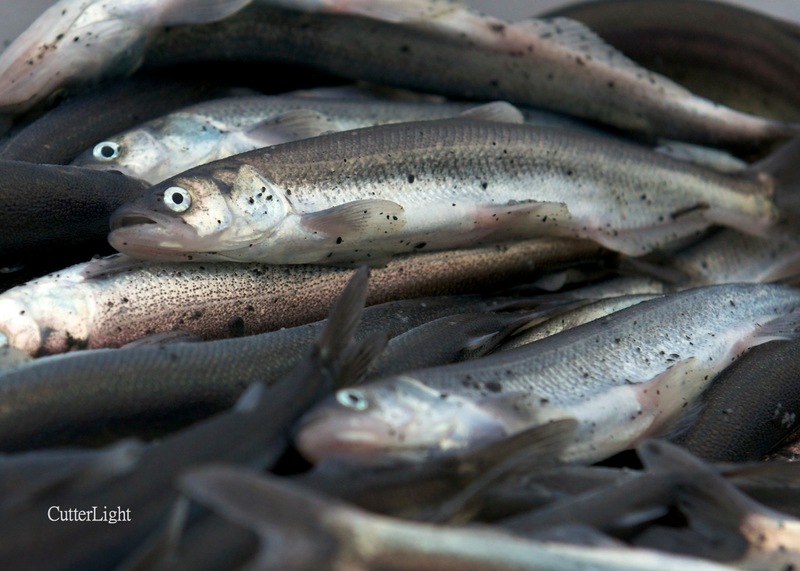 Eulachon are packed with oil when they begin their spawning run – roughly 15% of their body weight. Dried, they can be lit and will burn like a candle, which is why early explorers in North American called them candlefish. The term eulachon is derived from the Chinook language. When the hooligan are making their spring-time run in the Pacific Northwest, dip-netters from Oregon to Alaska gather along the banks of their natal streams and rivers to scoop up a few pounds for the pan and the smoker. An anadromous species, these members of Osmeridae (the smelt family) spend most of their lives in the ocean and ascend the rivers of their birth to spawn and die. At this time, they don’t feed, so dip-netting is the best way to harvest them. 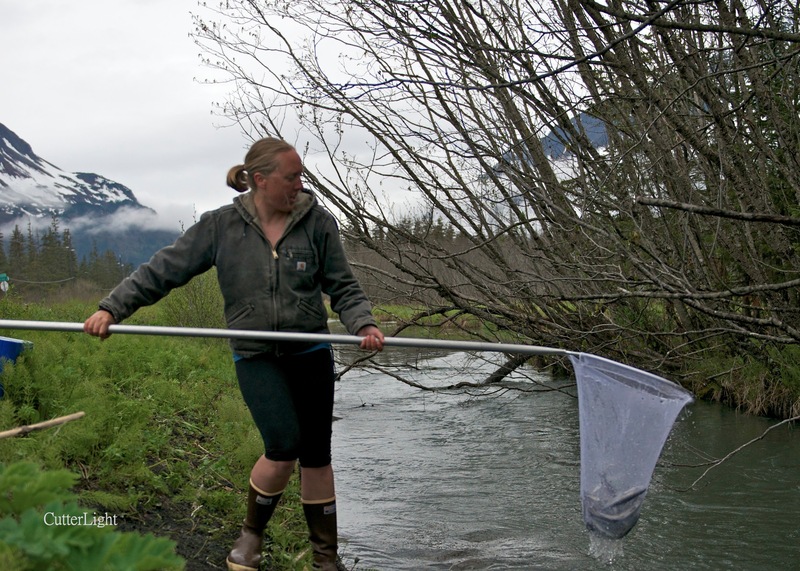 Our friend Krystin scoops up a netful of hooligan from a small stream near Seward. Right: When the fish are in, it can be possible to catch them by hand. It took Krystin a few minutes to grab these fish one at a time. The bones of cooked or smoked smelt are soft, and many people (including us) eat them whole from head to tail. Gravid females (those with ripe roe) are our favorites. 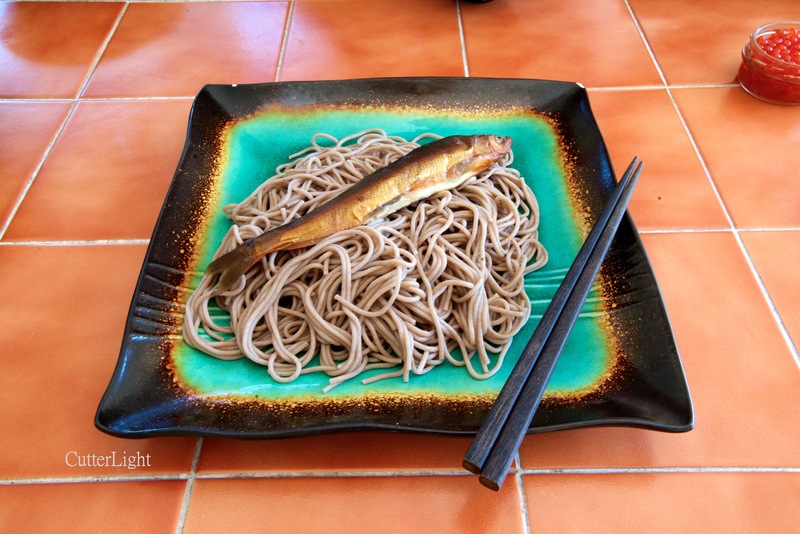 Zaru soba – cold buckwheat noodles – is a perfect dish for the hot weather we’ve been having lately. Topped with a smoked smelt from the refrigerator, this dish can be garnished with salmon roe, nori or served as is. You can used a store-bought noodle dipping sauce or make your own with a little rice vinegar, a little soy sauce, a little brown sugar, ice-cold water and a sprinkling of sesame seeds. Hand catching fish what a great way to get dinner. Another reason to love Alaska! We’ve got a date set to dip-net reds on the Copper River later this month. We’re hoping to smoke and can lots! Have you ever made Japanese-style nitsuke (braised in soy sauce/mirin) with these fish? Reply. No, we haven’t. Thanks for the excellent idea. These look so good. I love fish cooked in this way. I still remember watching fresh sardines being grilled in Portugal on an open barbecue by the owner of the little family restaurant where we’d been fortunate in deciding to eat; the taste of them, and the enjoyment of that meal has never gone away. Thanks for sharing the experience with us. You’re welcome to share our blog. Thanks for asking! I’m curious about the gravid females. I cleaned out all my fish yesterday and discarded the roe (only a small percent were female, interestingly enough). For the future, however – Do you leave the fish whole? Or somehow remove the entrails but leave the eggs (which sounds like a magic trick)? As an aside, I kept the roe in a separate freezer bag which I threw in my freezer, thinking that I’ll either find a way to prepare them or at least feed them to my neighbor’s chickens for a healthy tasty treat – and better eggs! Any tips for preparing them for human consumption? Great questions, Betsi. The gravid females make for the best dining, in our opinion. 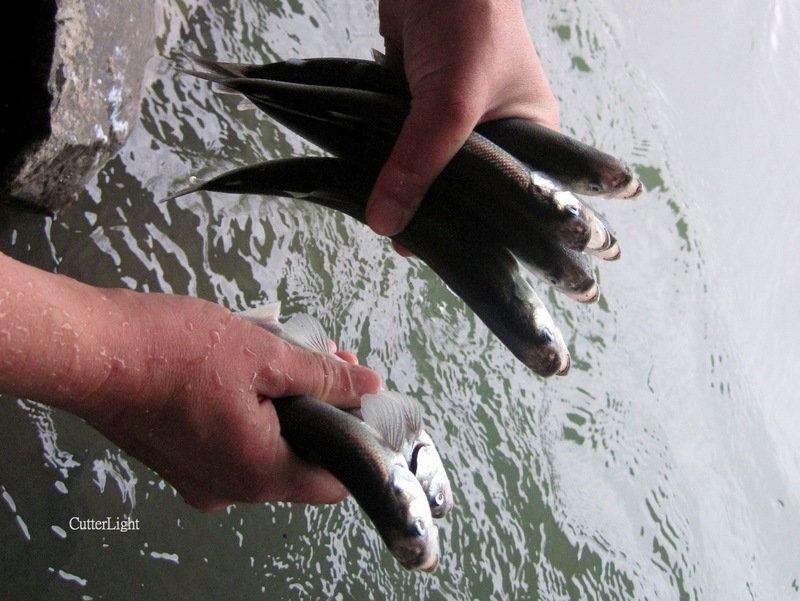 We typically do not remove the entrails of smelt – just the gills – and we eat them head to tail. Japanese chefs serve the roe, cured, and it’s quite good. But we don’t know the method they use to accomplish this.